Video games, in general, require that we suspend our disbelief to some degree. We can forgive the unbelievable or the improbable so long as the experience remains entertaining. Games are full of trivial details that make no sense -- eating food magically heals wounds, a three-foot tall wall is insurmountable by a grown adult, etc. -- but we overlook these small annoyances for the sake of enjoyment. The thesis of Amy, based on my experience, is very simple: Take every one of those annoyances and build an entire game out of them. The titular character, Amy, is a little girl with psychic power and the inability to speak. She and a woman named Lana are on the run from some place called "the Center" and its (presumably) evil director "the Professor." As their train speeds toward Silver City, something falls out of the sky and hits the Center with a blinding flash. The train derails and Lana wakes up in an abandoned train station. After locating Amy, the two of them wander off in search of Ellen, who is a doctor at a hospital somewhere. Along the way, we meet what may or may not be zombies and soldiers that seem to work for the mysterious Center. Annoyingly vague? Too bad, because that's as clear as Amy ever gets. What is "the Center?" Lana worked there, I guess? Was she Amy's teacher? Why can't Amy speak -- is she developmentally disabled? Where did her psychic abilities come from? Lana was evidently testing Amy's powers at the Center, why? What fell from the sky? Who are these soldiers and why does the Center employ them? Who is the Professor? Who is Ellen? Throughout the many hours of Amy, these questions and many more are never answered. But we forgive lame, nonsensical plots all the time, right? OK, so let's table the plot (for now) and focus on gameplay. 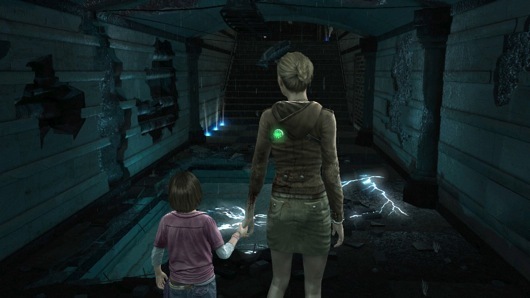 Players take control of Lana, who must protect Amy from the occasional zombie whilst escorting her to safety. Combat is a one note affair, with Lana following properly timed dodges with a nice smack from a (breakable) blunt stick. That accounts for half of the weapons in the game, incidentally, with the other being a crowbar (also breakable, bizarrely). Lana can also direct Amy to accomplish certain goals. If Lana encounters a locked door, for example, she might send Amy scurrying through a conveniently placed vent so she can unlock the door from the other side. I also quite like the contamination mechanic, which has Lana contracting the zombie virus if she wanders too far from Amy. It starts to grow tiresome, however, when you have Amy summon an elevator for the twentieth time, and it doesn't help that much of the gameplay is riddled with the same inconsistencies and head-scratching moments as the story. Rather than laboriously listing every fault, here's an example. In the train station, Lana is confronted with a chain-link gate arcing with deadly electricity. The solution is simple enough: turn off the power. It's a video game, so of course the power station is nearby. With the power off, Lana heads back to the gate, which is still sparking. She then proceeds to open the gate by using an electric button. Even though she just shut off the power. It's only a hiccup in the first hour of the game but, unfortunately, it's indicative of the entire experience. The controls are awkward; characters get stuck in geometry or fall off of ledges; there are hallways to nowhere; objectives are unclear; and perhaps the most grievous of all design sins, there is, inexplicably, a poorly executed stealth level towards the end of the game. Actually, I take that back; the most grievous sin is the save system. Each level must be finished in one sitting. The checkpoints are sparse. Quit, and you have to start the entire level over, which wouldn't be so bad if every single action in Amy wasn't achingly ponderous. A note for developers: if a ladder climbing animation is so slow that players have the option of skipping it, maybe something is wrong with it. But perhaps I shouldn't be too hard on Amy because, as far as I can tell, it isn't finished. Players are allowed to use Amy's psychic powers, for instance, enabling her to send out shock waves or create spheres of silence -- the problem is that's all she can do. Despite the fact that there are five slots in Amy's power selection menu, I only encountered two powers in the whole game. Where are the other three? I know I didn't miss them, because the manual states quite clearly that there are only two powers. In another instance, when Lana and Amy finally reached Ellen's hospital, I found a strange laboratory lined with glass cylinders, each with a glowing fetus floating inside. Again, this was in a hospital, in what was supposed to be Lana and Amy's safe haven. Was there ever a plot point explaining it? Did the developers just throw it in there to be creepy? And then there's the end credit sequence, which shows off locales and monsters that were nowhere to be seen in the campaign. Now, even if I somehow sidestepped this content -- maybe it's only in hard mode, or something -- you couldn't convince me to play through again just to find it. It's almost unfair to review Amy, given the state it's in. On the other hand, it's sort of unfair that it was published at all. The thought of anyone spending money on Amy -- possibly drawn in by the promising trailers -- only to wind up with this mess, is quite honestly a little enraging. There might have been a decent story here once, or even good survival horror, but it's gone now. This review is based on the Xbox Live Arcade version of Amy provided by Lexis Numerique. Joystiq's review scores are based on a scale of whether the game in question is worth your time -- a five-star being a definitive "yes," and a one-star being a definitive "no." Read here for more information on our ratings guidelines. Great for travelers and people with older houses.